Home » Tallinn restaurants » Eating out in Tallinn – find a free table in a suitable restaurant in no time! Eating out in Tallinn – find a free table in a suitable restaurant in no time! Would you like to have a dinner in your favourite restaurant but not sure if they have a table? You are in a hurry and lack the time to look up for a phone number or to call? Open vabalaud.ee homepage, type a name of the restaurant and see in the real time if a table is available, and, if necessary, fill in a couple of fields and get a confirmation for booking on your name. If a desired restaurant does not offer booking in real time, vabalaud.ee will contact you in two hours upon making a reservation to confirm booking or recommend another attractive place. On the other hand, if you do not look for a particular restaurant, but you still would like to book a table somewhere nice, e.g. 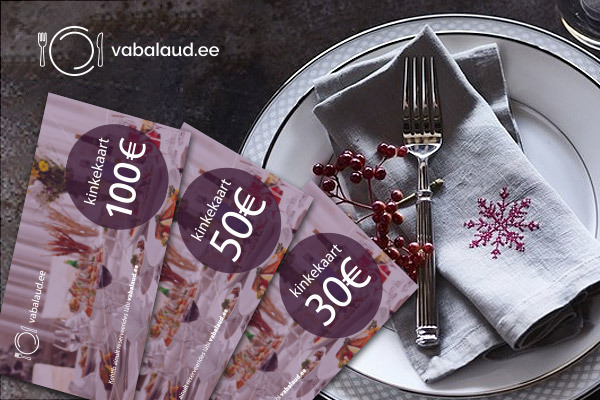 a restaurant in the Old Town, where the desired dishes are served, then vabalaud.ee is your best friend as a complete and convenient search engine. Simply indicate the date, number of visitors, and choose or find a region, the desired cuisine and check where you can book a table immediately. After picking a place, fill in a few fields and confirm your booking. Loyal customers enjoy the shortest way to book in a couple of clicks! You can also book conveniently using your Smart device as vabalaud.ee operates in mobile phones as well and is adaptable to your device. In a case, when you want to take your colleagues or business partners to dinner, where you will be seated in a private atmosphere, Vabalaud gives you a helping hand. Just select a number of visitors, date and type in the search “private room”, perform a search and make a booking. In the case of larger companies we cannot offer an immediate confirmation at any restaurant, but the consultant of Vabalaud will send you a confirmation in two hours or contact you should you have any special requests. We may find you another place if there is no possibility to host your group in a specific place on a specific date. Do not hesitate and dine today at Tallinn restaurants! No Comment to " Eating out in Tallinn – find a free table in a suitable restaurant in no time! "